The Founder and Leader of the Synagogue, Church Of All Nations (SCOAN), Prophet T.B. Joshua lifted the terrifying news on the shoulders of Ghanaians when he reiterated in his revelation that God has heard the cry of Ghanaians, and that no terror attack will befall the nation. Prophet TB Joshua commended Ghana at how stringent steps was taken by the security apparatus in ensuring that, the nation is safe from any terror attack. The Man of God, in his submission revealed that Ghana’s strategy and tactics of “heart to heart awareness” and the love for one another needs to be emulated by the rest of the world. 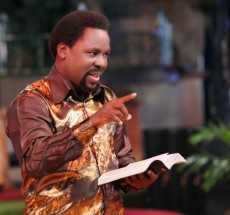 Last week Sunday, Prophet TB Joshua has said Ghana and Nigeria would face a possible terror attack. He said, the said attack would happen between Thursday, Friday, and Saturday. “I want us to come together to pray for these two nations . . . because I am seeing Thursday, Friday Saturday if I may say Thursday; these evil people are very funny anything can just happen. I see Thursday, Friday, pray for these two nations, Nigeria and Ghana over gathering in anyway over attack,” he said. “I am seeing an attack and that will be in a foreign way not local way,” TB Joshua said.